Black holes are created when a supermassive star collapses, creating a region in space where the escape velocity exceeds the speed of light. These strange objects don’t emit radiation directly, but radiation is emitted by matter accelerating as it enters the event horizon of the black hole (this is the region around the center of the black hole where the gravity becomes so high that light, once it enters, cannot escape). Radiation can also be emitted when particle/antiparticle pairs are created at the event horizon, where one of the pair enters the black hole and the other does not (this is called Hawking radiation after the physicist, Stephen Hawking). Using an array of 8 international radio telescopes astrophysicists have used sophisticated signal processing algorithms to turn 14 petabytes of data obtained from observations of a black hole in a neighboring galaxy into the first image of the event horizon of a black hole. The figure below, which appeared on the front of newspapers worldwide a few days ago, is shown below. This particular black hole is located 55 million light-years away (in galaxy Messier 87), is 3 million times the size of the Earth, with a mass 6.5 times that of the Earth’s sun. An article in the Register gives details on the 8 detection sites and the very-long-baseline interferometry (VLBI) method used to combine the various images. 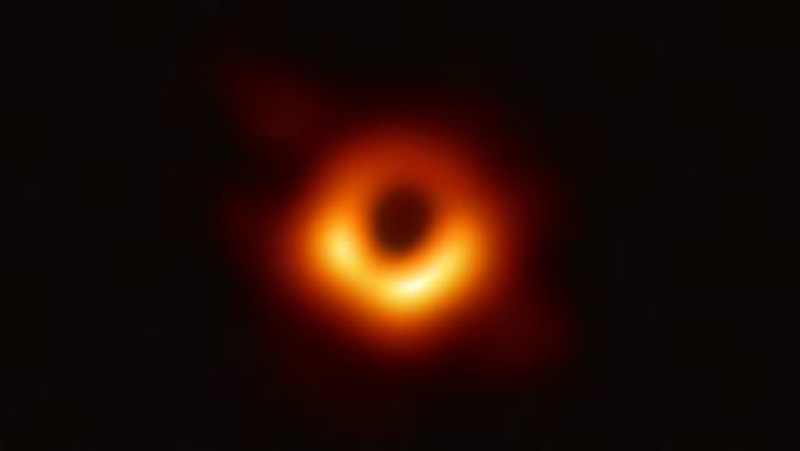 The real key to extracting this amazing image of the event horizon of a black hole was the use of advanced signal processing algorithms to process all this data. An important algorithm for this work was contributed by IEEE Signal Processing Society member, Katie Bouman. Katie developed the algorithm while she was a graduate student at the Computer Science and Artificial Intelligence Laboratory at MIT. The below picture shows Katie with hard disk drives used in the black hole event horizon imaging project.